Grilled cheese fans, did you know April is "National Grilled Cheese Month"? If not, well you're in for a treat! The Wisconsin Milk Marketing Board reached out to me recently to come up with a grilled cheese recipe highlighting Wisconsin Cheese. Luckily for me, I'm pretty familiar with Wisconsin cheese, having grown up near the Illinois-Wisconsin border. In fact, last year I hosted a Wisconsin Cheese Tour that was full of cheese fun! As for a grilled cheese recipe, I came up with this Chicken Pesto Grilled Cheese Sandwich. 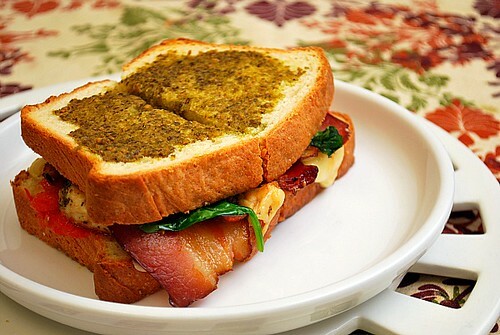 It's a sandwich that captures one of my favorite combinations of chicken, pesto, bacon and swiss. This sandwich has Wisconsin all over it! I took a grilled chicken breast and paired it with Wisconsin's own Nueske bacon. For that touch of creamy, melted cheese, I used Wisconsin Swiss cheese and for an added punch of flavor, I smeared a homemade pesto on both sides of homemade American Sandwich Bread. For additional color and freshness, I also included slices of fresh tomato and a handful of baby spinach. Be sure to check out all the Grilled Cheese Sandwiches featured next month on the Grilled Cheese Academy website. There's quite a few out there now that are pretty drool-worthy and you'll be craving a grilled cheese sandwich before you know it! Heat large skillet or sauté pan over medium heat and melt the butter. Spread both sides of each bread slice with pesto. Place 1 slice down in pan. Top with the grilled chicken breast, 1 slice Swiss cheese, bacon slices, baby spinach, tomato slices and remaining slice of Swiss cheese. Place the remaining bread slice on top of sandwich. Grill, turning sandwich once until bread is golden and cheese is melted. Serve warm. This is the EXACT thing I want to eat at this very moment! YUM! Oh yum - that looks amazing!